Tonino Lamborghini Alpha One: Elegant & Exclusive. 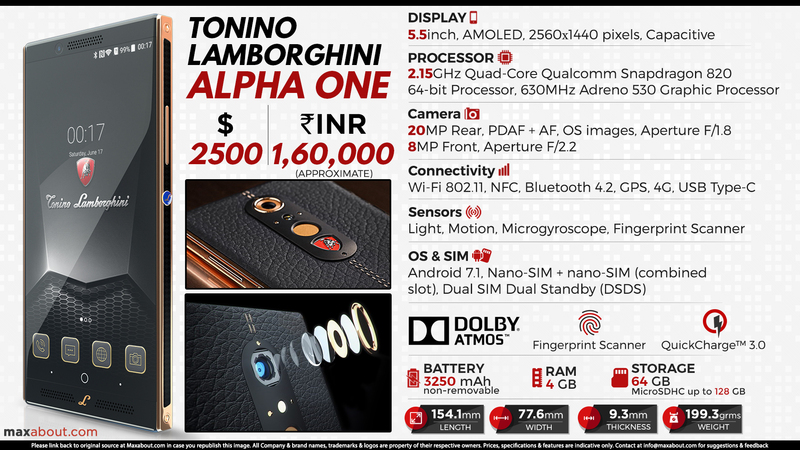 Tonino Lamborghini Alpha One, a pure luxury focused Android smartphone, was recently launched internationally at $2500 (INR 1,60,300 approx). This price tag goes parallel with the hefty price association of luxury Lamborghini cars. It will first go on sale in UK and UAE, available first at Harrods and Dubai Mall respectively. It was made with premium handcrafted leather from Italy and liquid alloy, carrying impressive features like 5.5 inch QHD display, 2560 x 1440 pixel resolution, Quad Core Qualcomm Snapdragon 820 processor, 4GB of RAM and 64GB internal storage. Alpha One comes with Android 7.1 and does not promise Android Oreo update till date. It comes with 20 MP rear camera that brings PDAF, f/1.8 aperture and LED flash with itself. Front camera used here is 8MP with no such goodies on offer. Tonino Lamborghini Alpha One weigh 199.36 grams, making it quite heavy with the use of liquid alloy in its built. A non-removable 3250 mAh battery with quick charge 3.0 has been used on the phone. Alpha One supports dual SIM and fingerprint sensor for added utility on the smartphone. Buyers will even find Lamborghini logo right under the fingerprint sensor placed on the backside of Alpha One.